Order in the next 3 hours, 19 minutes an 20 seconds for same day shipping. 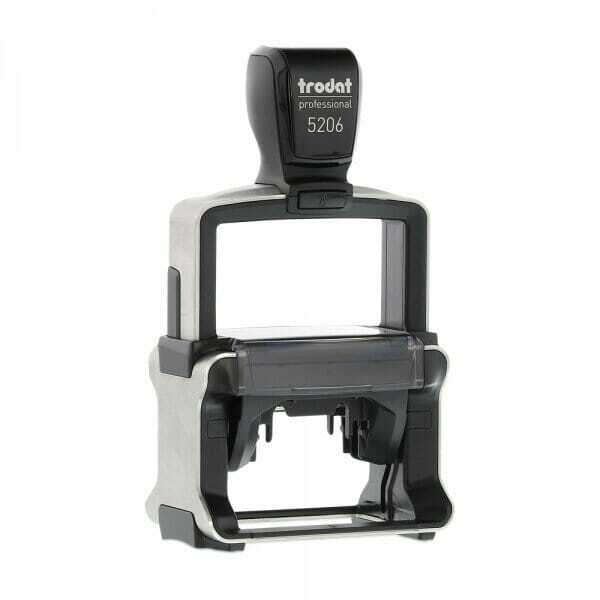 The new Trodat Professional 5206 self-inking stamp is perfect for everyday use in a busy office environment, thanks to its new brushed stainless steel finish and high quality plastic build. An impression size of 55 x 32mm allows you to stamp up to 8 lines of personalised text, whether you use one of our templates or upload your own customised information. The ergonomic handle is complemented with cushioning elements on the handle and feet to reduce stamp vibrations. Environmentally friendly, this stamp is manufactured using a high content of recycled plastic ensuring it's climate neutral. Ideal for printing your company address, contact details, illustrations with logo, advertising, accounting or warehouse documentation. The compatible replacement ink pad is 6/56 available in black, blue, red, green and violet. Dry felt pads are suitable for special inks. Customer evaluation for "Trodat Professional 5206 56 x 33 mm - 8 lines"
Fantastic stamp. It only took 2 days. Fantastic stamp. It only took 2 days until I had the stamp in my office. Exactly the way I designed it online. Free shipping.